Substance use disorders commonly co-occur with anxiety disorders. Diagnosing anxiety disorders in the face of active substance use and withdrawal can be very challenging due to the significant symptom overlap. This symptom overlap often leads to delayed or inadequate treatment. When treating individuals with generalized anxiety disorder and a substance use disorder, benzodiazepines should be avoided. Selective serotonin reuptake inhibitors (SSRIs) or serotonin-norepinephrine reuptake inhibitors are FDA-approved to treat GAD and are fairly safe in substance users. Other non-FDA approved medications will also be discussed. 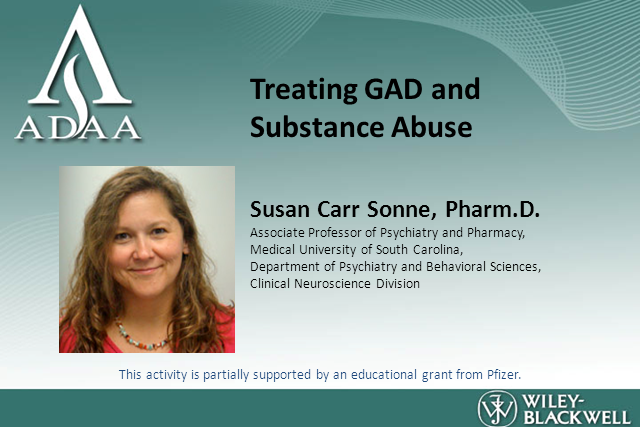 Dr. Susan Sonne is active in research and teaching as Associate Professor of Psychiatry and Pharmacy at the Medical University of South Carolina, Department of Psychiatry and Behavioral Sciences, Clinical Neuroscience Division. Generalized Anxiety Disorder (GAD) is common, chronic, and associated with substantial impairment in function and quality of life. GAD commonly occurs comorbid with mood disorders and anxiety disorders. GAD comorbidity has been clearly linked to additive worsening of outcomes and function in both Major Depressive Disorder and in Bipolar Disorder. This presentation will provide an update on current understandings about the incidence and nature of GAD and comorbid disorders, and their impact on patient health. Naomi Michele Simon, M.D., M.Sc. Dr. Naomi M. Simon is Associate Director of the Center for Anxiety and Traumatic Stress Disorders and Director of the recently established Complicated Grief Program at Massachusetts General Hospital, and is Associate Professor of Psychiatry, Harvard Medical School. By 2050 there will be over 150 million older adults with anxiety disorders globally. Symptoms include sleep disturbance, interference with daily activities and distress, which can lead to medical illness such as coronary heart disease, disability, and higher levels of health care utilization. - How anxiety disorders in older adults differ from the disorders in younger adults. ~ They can be more detrimental to health and cognition in older adults. ~ These disorders may be more treatment-resistant, requiring aggressive treatment such as the combination of medication and psychotherapy. - Why late-life anxiety disorders are undetected and undertreated. - The benefits of using antidepressants and Cognitive-Behavioral Therapy as safer alternatives to treatment for these disorders in older adults. Dr. Lenze completed medical school and psychiatry residency at Washington University School of Medicine. He trained in a geriatric psychiatry fellowship and a clinical research fellowship at University of Pittsburgh, then joined the faculty, as part of the Advanced Center for Interventions and Services Research in Late-life mood disorders. In 2007, he returned to Washington University to focus on treatment studies in late-life anxiety disorders and depression. He carries out clinical research in disabled rehabilitating elderly populations and runs a faculty practice treating late-life anxiety disorders and depression. Dr. Culpepper has conducted federally funded studies of depression and anxiety, otitis media, and school-based and community interventions to improve pregnancy outcomes and to prevent teen pregnancies. He currently is the principal investigator of an AHRQ funded developmental center for patient safety research devoted to the study of problems affecting low income and minority vulnerable populations in ambulatory care settings, and co-investigator of the Primary Care Anxiety Project, a study of the course of anxiety disorders in primary care settings. Dr. Culpepper also is Chief of Family Practice at Boston Medical Center. He received his MD degree from Baylor College of Medicine and his MPH degree from Boston University. - Discuss current evidence-based psychotherapeutic treatments for adults with generalized anxiety disorder. - Identify characteristics of generalized anxiety disorder. - Design a psychosocial treatment plan with patients with GAD. Dr. Mennin has focused his research program on understanding and treating chronic and reoccurring bouts of anxiety and mood disorders, particularly worry, stress, and depression. Our understanding of problems related to anxiety and depression has increased exponentially in the past twenty years. Advances in biological and behavioral technologies has helped us shine light on how everyday feelings such as fear and sadness can, in some individuals, translate into emotional disorder. - plan evidence-based treatment for individuals with GAD and gad and comorbid disorders including depression, sleep disorders, cardiac illnesses and IBS. Dr. Pollack’s areas of clinical and research interest include the acute and long-term course, pathophysiology, and treatment of patients with anxiety disorders and associated comorbidities, development of novel pharmacologic agents for mood and anxiety disorders, uses of combined cognitive-behavioral and pharmacologic therapies for treatment refractory patients, presentation and treatment of anxiety in the medical setting, and the pathophysiology and treatment of substance abuse.